As college bowl season cranks up, here’s an interesting random fact. Of the NFL’s 32 teams, 11 have a starting quarterback who played high school or college football in Texas (two from Westlake High if you count the injured Nick Foles). With oil prices cratering, NFL quarterbacks may soon be the state’s most valuable export. Nineteen of the NFL’s starting QB’s come from a Southern state. 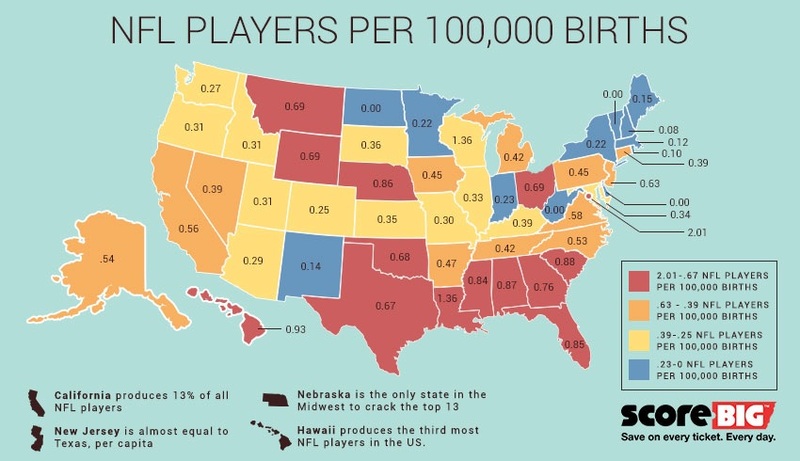 Mississippi produces seven times as many NFL players per capita as Massachusetts and almost four times as many as New York. America’s favorite sport is overwhelmingly Southern. Another interesting note. Every year about 80 college players make an NFL roster. About 30-35 college students earn a Rhodes Scholarship. Louisiana has by far the largest number of players who make an NFL squad, almost twice Texas’ percentage. Going back through more than a decade of listings I can’t find a single Rhodes Scholarship winner from a Louisiana university. Dang, UH scored 22 points in the last 4 minutes of the Armed Forces Bowl to win 35-34. Interesting statistics about Houstonians supporting arts over sports. Happy new year to everyone. Support an artist. Don’t buy NFL tickets, buy art from a local artist. And regarding the stats in this blog, every once in a while you have that rare combination of talent and genius of an NFL player who is also a Rhodes Scholar, most notably Ram s QB Pat Haden and most recently Safety Myron Rolle from Florida State who was a 6th round draft choice by the Titans and played 3 years in the NFL. Here are some mind blowing stats regarding Heisman Trophy winners and the NFL. And I guess you can already add party boy Johnny Piñata Manziel to the list of Heisman QB NFL busts already after less than a game and a half of abysmal play and went straight to IR with a “hamstring injury”. Riiiight. By the way RoR, what kind of helicopter is in your avatar? I’m guessing some type of Russian Hind? Not recognizable to me as an Apache or Blackhawk. An MH-53 Pave Low Jolly Green Giant. Thanks RoR. Would never have guessed. That’s impressive a good ole Sikorsky Sea Stallion can look that menacing all souped up for Special Ops. Bubba, Fly low, get in, get business done, and get the hell out. I believe they retired this helicopter from the US inventory. Sad if true because that is one tuff’ looking helicopter in Spec Ops configuration. Yes, they retired them 2008. They were a mean machine and I loved flying them. Happy New Year one and all be merry but be safe. TCU just beat the socks off Mississippi 3-42 Go Horn Frogs! Mississippi didn’t know what hit them! And Notre Dame whipped LSU here in Tennessee. New York and Mass outweigh the southern states in Rhodes scholars by a pretty hefty margin, but that gap is muted by the way the scholarships have been awarded for the past few decades. The southern schools benefit from a sort of regional affirmative action. The Rhodes committee balances US awards by region, so the competition for northeastern students is much more fierce than for students in the southeast. Scholarships are equally balanced among the four US regions. Aw, shucks, Chris! Here I’ve been thinking that Rick Perry was Texas most valuable export! Happy New Year and may your team(s) bring home the bacon!